The Poseidon Thermal Park is the biggest thermal park of the island. It is situated in the beautiful bay of Citara, in the commune of Forio. In the Poseidon thermal park we can find 22 pools with highly curative waters built in accordance with the modern medical standards. Every pool has its own constant temperature ranging from 20° and 40°. The water is constantly replenished so it is clear and limpid. 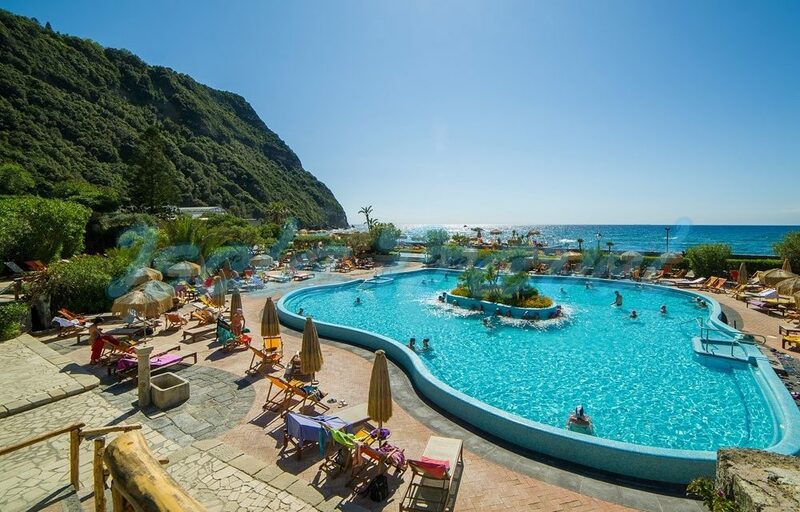 The park offers sun-beds and beach umbrellas, sauna, underwater massages, Kneipp and Japanese treatments for the blood circulation and many restaurants, one of them is set on a beautiful cave of local tuff. The Poseidon Thermal Park also has a natural sauna that is a steam room inside a grotto carved into the tuff. The Japanese bath is a path with alternating hot/cold water – 40° C/15° C – littered with shingle to walk on to stimulate the circulation of the lower limbs and give the body a sense of general well-being. We recommend you to start from Kneipp, with the alternation of hot and cold water, which promotes blood circulation and then enter into the sauna that has natural vapors of the local water. At the Kneipp baths you have a 15°C pool next to a 40°C pool so the contrast in temperatures is most harshly felt there. The idea is to spend up to 15 seconds in the extremely cold 15°C pool before the welcome relief of the 40° C pool next to it, a hydrotherapy system invented by the German priest, Sebastien Kneipp. When you are relaxing in the pools your eye is caught by the beauty of the surrounding landscape: the rocks on the coast overlooking the gardens harmonized with the freshness of Mediterranean vegetation that covers Punta Imperatore. Poseidon Thermal Gardens is a beautiful place with a picturesque view in the bay of Citara. Here you can relax in a stress-free and calming surroundings in which you can completely switch off and take advantage of the thermal water. The park has at its disposal a large area and the pools are spread around so that each is easily accessible from the other. There is plenty of sunbeds, parasols and benches available. There’s also a children’s area, an indoor pool and lounge area, spa, male and female cosmetic treatments, massages, sea-water pool, a boutique and a cafe-bar/restaurant where you can choose from a wide range of snacks, meals or drinks. Do you need more information to visit the "Poseidon Thermal Gardens"?